Honda are expecting big things from their little Honda when it goes on sale across the World this month. 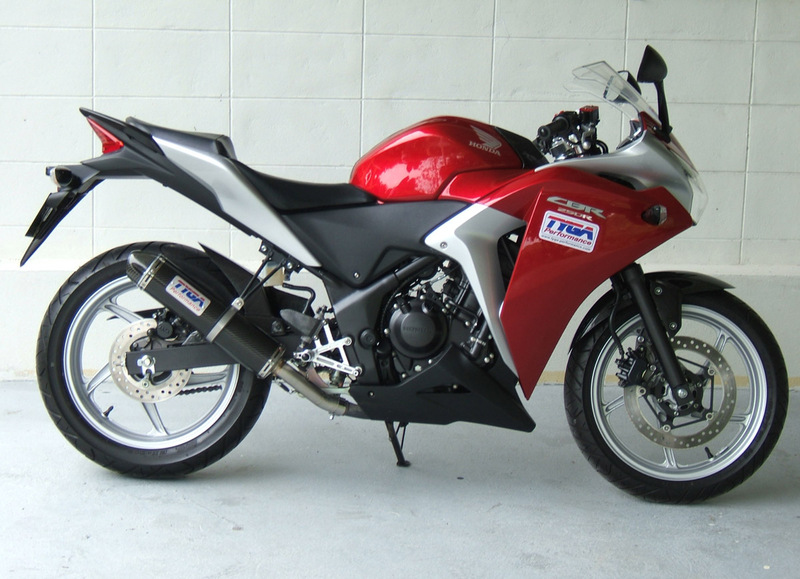 Because the CBR250R is made here in Thailand, we actually got a new model first before everyone else for a change! Last November, the world's press was invited by Honda to the nearby Bira Circuit where local stars such as Ratthapark helped give it some seriously needed sports credibility. It was then released to the general public in December and given a huge push at the Bangkok Motorcycle Show at the end of the year. You can even see them in glass display cases at every downtown skytrain station. 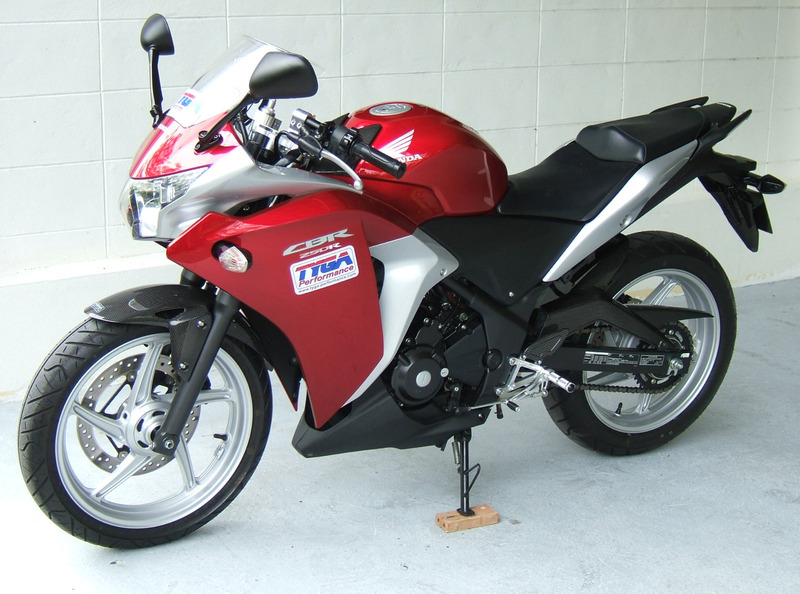 What I am leading up to is that we got the opportunity to get going on some upgrades for the CBR250R so that by the time you are reading this, we have a wide and growing range of products which we will continue to add to during 2011 and beyond. 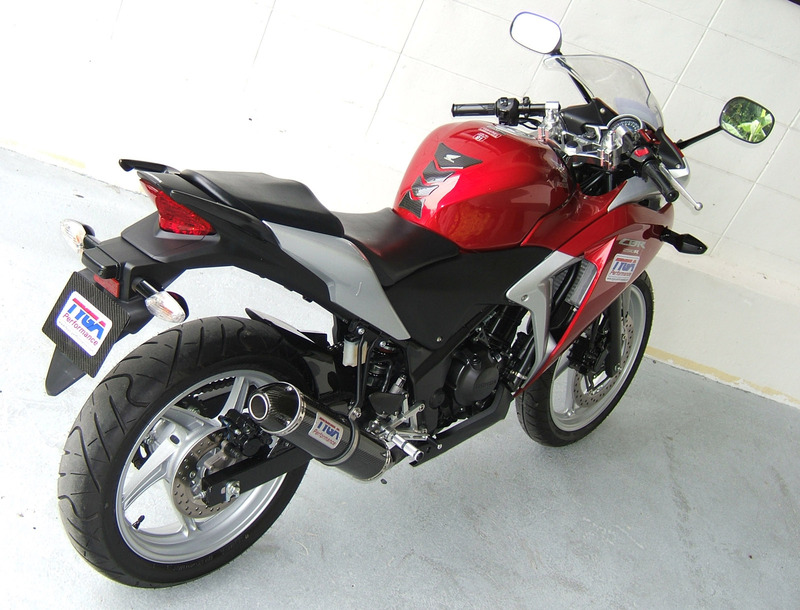 If Honda are expecting to sell a lot of these bikes, well, we are certainly hoping they are right. Otherwise, we will be wondering why we didn't spend our time and money developing some cool parts for an ancient stinkwheel instead! So what have we been doing? Well, after a close examination of the 250, and although it has some nice touches such as the instruments, it definitely has a bit of budget look about it. 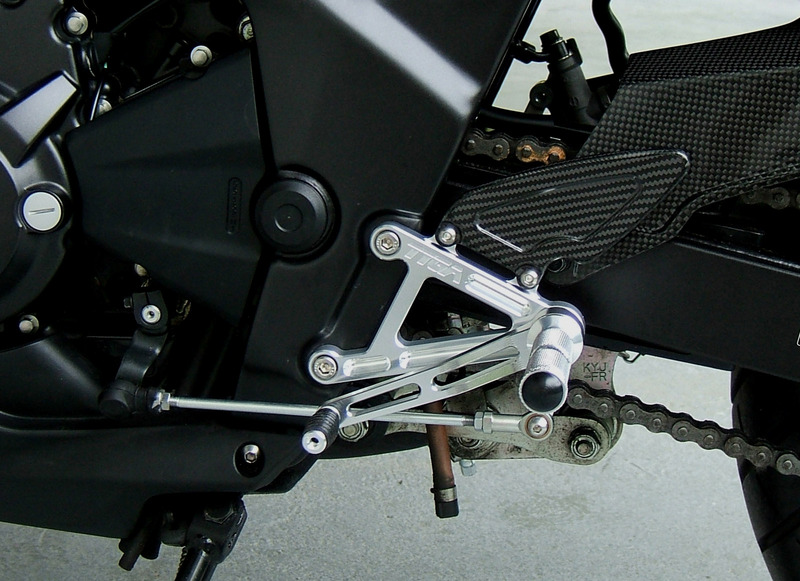 The cast foot peg hangers are particularly nasty. 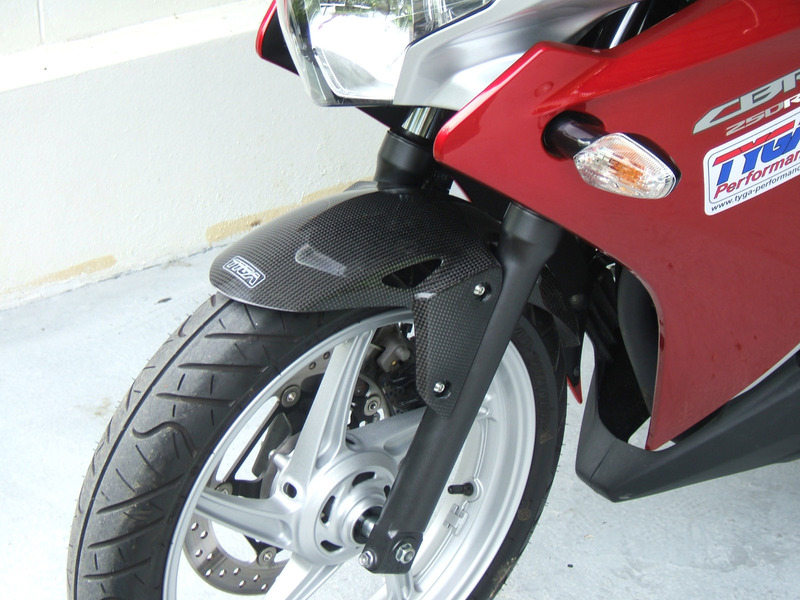 We therefore developed the more elegant and lightweight step kit you see here. 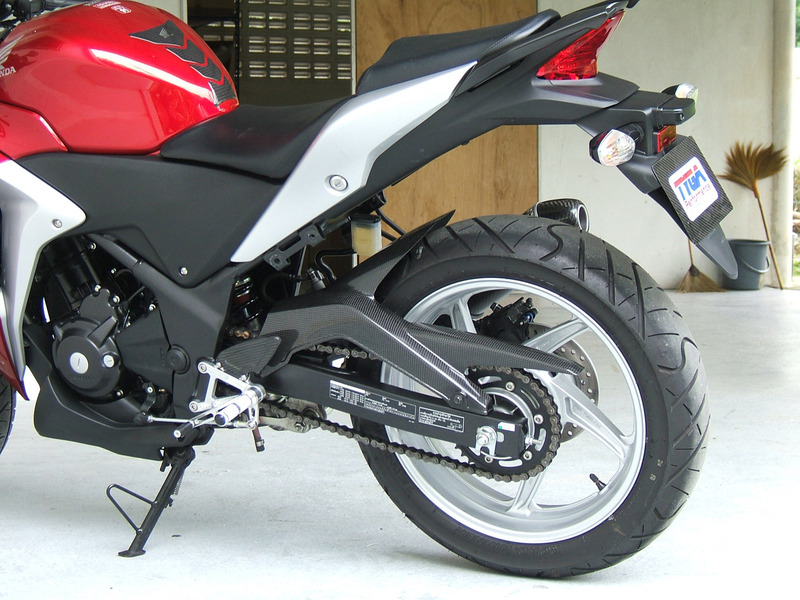 Not only does it look nicer but it moves the pegs up and back to give it a slightly more sporty riding position. 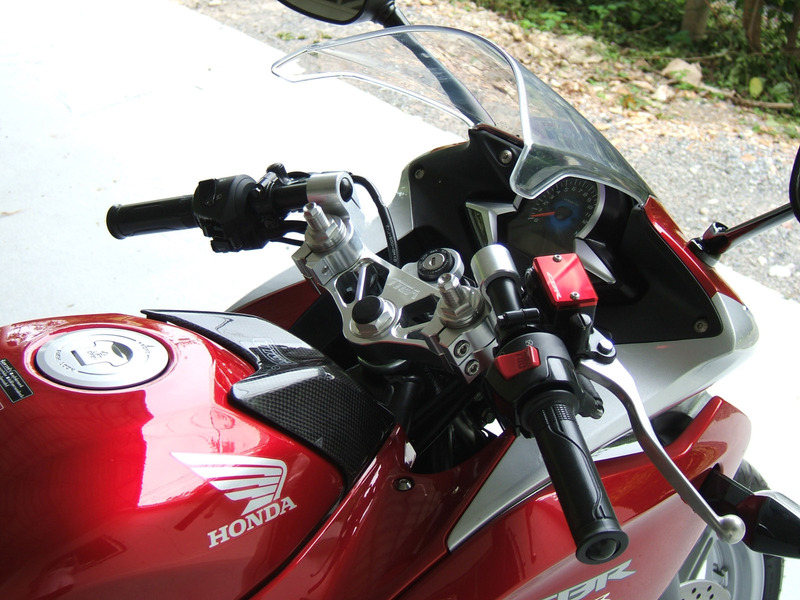 Gear shifts are slick and smooth and the step kit is supplied with a rear brake light switch holder so you just unhook the stock switch from the stock hanger and put it in ours for street riding. 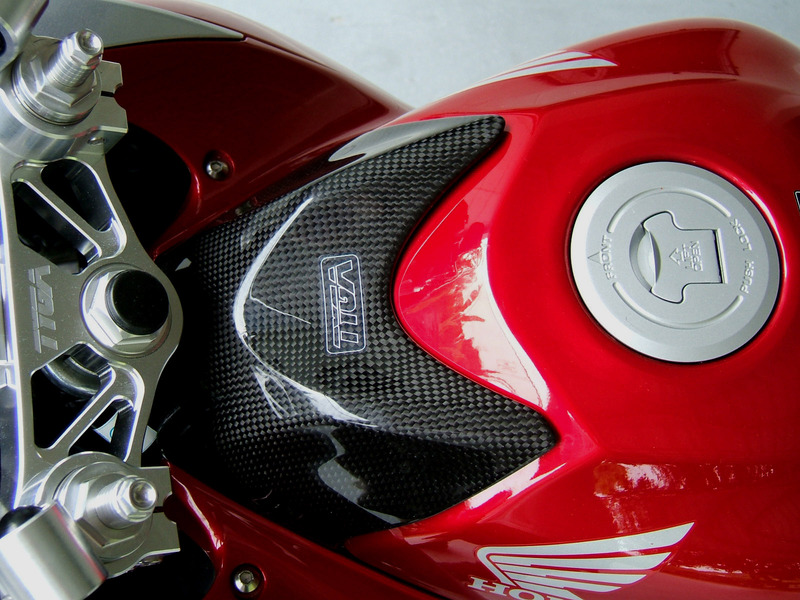 The hangers are supplied with a left carbon heel guard and for those with deeper pockets or the need for symmetry, there is an optional right side one too. 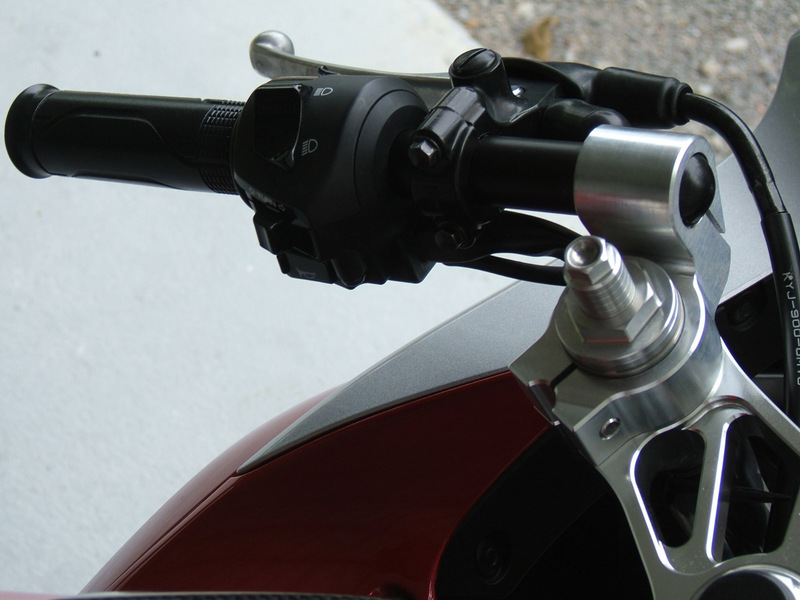 In conjunction with the rear sets, we are developing a set of bars that give the lowest reach that is possible without clearance issues come into play and serious redesigning of the bike is called for. 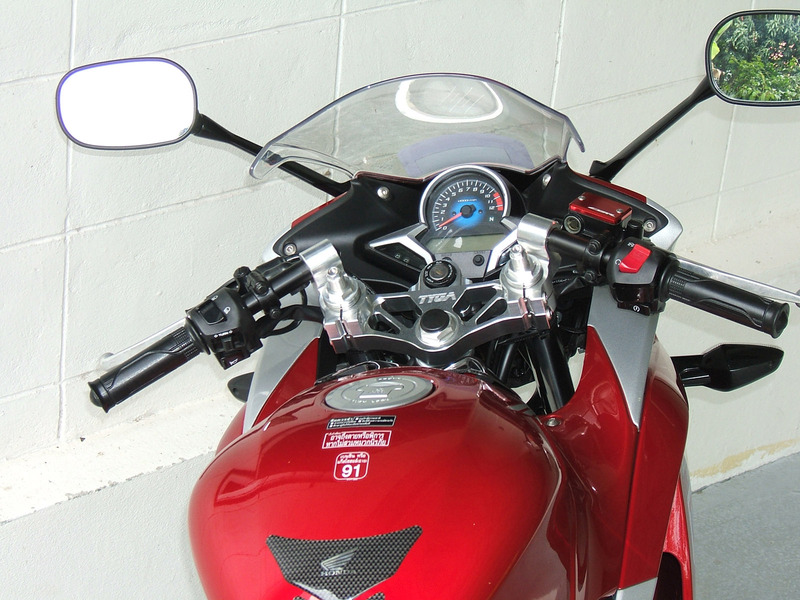 Nevertheless, these bars give a useful 20 mm lower reach and are slightly further forward than the stock bolt upright position. The position of the TYGA pegs and bars at least allow you to adopt a more tucked in position when the mood or circumstances arise. The bars by themselves do the job, but we couldn't resist the temptation to make a TYGA triple clamp to give the cockpit a more distinctive and memorable presence in this area of the bike. 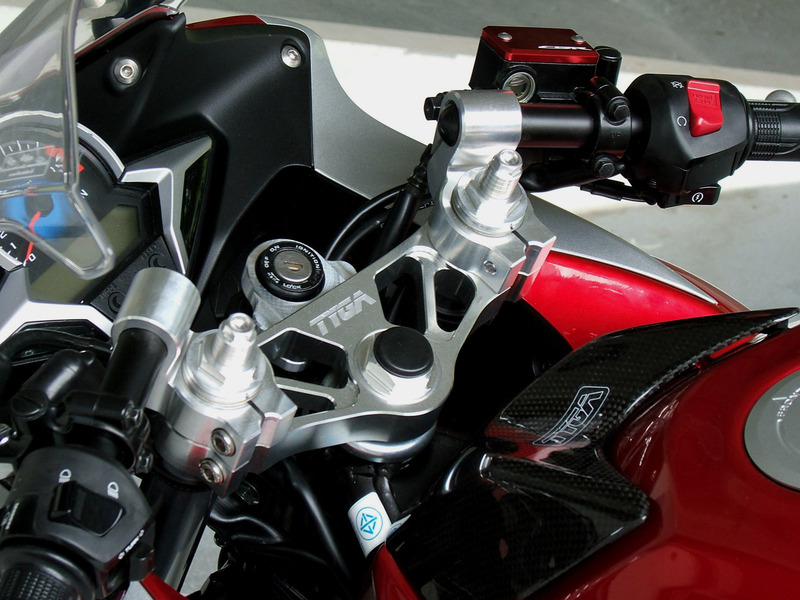 The TYGA triple clamp has a removable key holder, so it is ideal for all the budding racers. The bars and triple clamp can be installed together or alone in conjunction with the stock parts to give the widest choice. The bars seen here are just the basic design and the production ones will be somewhat sexier. Some keen eyed visitors to this page may have noticed that the end of the fork caps are different to the ones in the Honda publicity shots. That is because we have switched them for Tyga items which give preload adjustment from softer to harder than stock. The production version will be anodised in a nice colour just in case your friends' are sharp eyed enough to spot the mod! 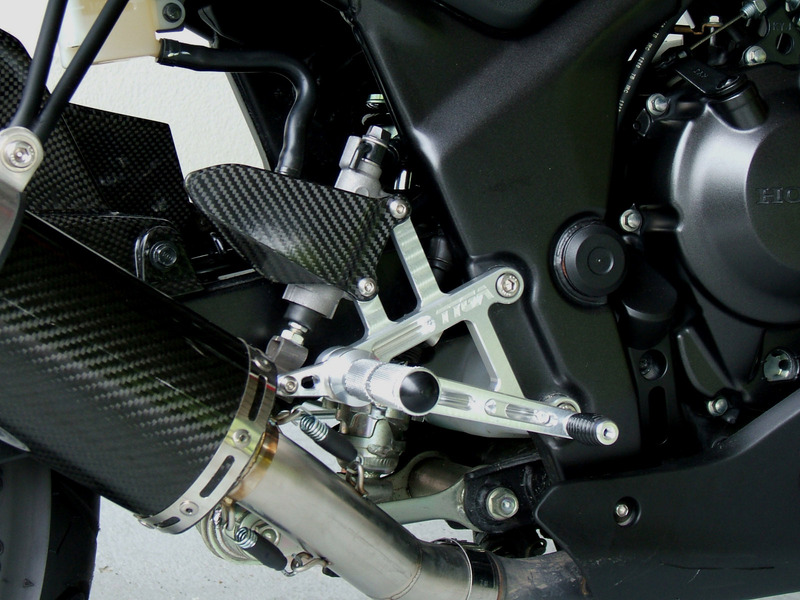 Moving across the bike, we have added some carbon touches. 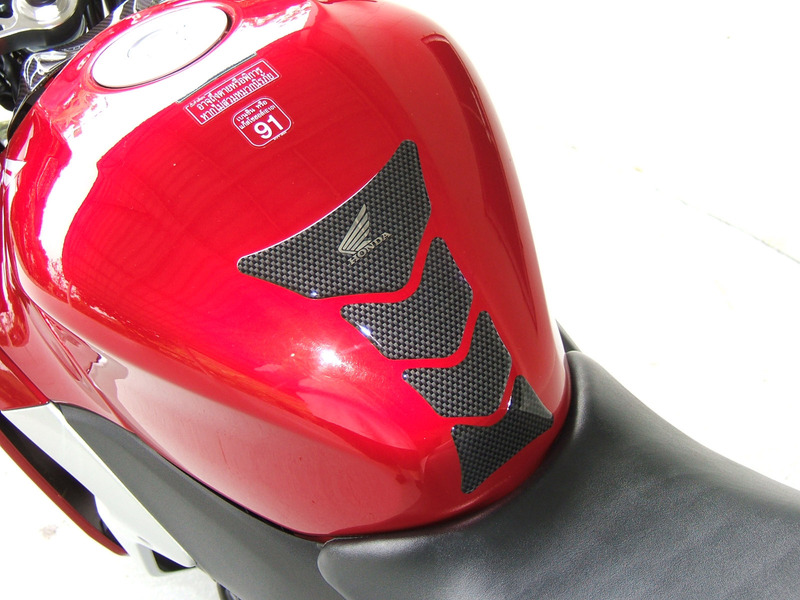 The tank cover is obvious but the front fender and rear hugger less so. These are available individually or as a set and we will be adding more carbon items from time to time. The fender and hugger are lighter than the parts they replace and, as unsprung weight, every little helps. 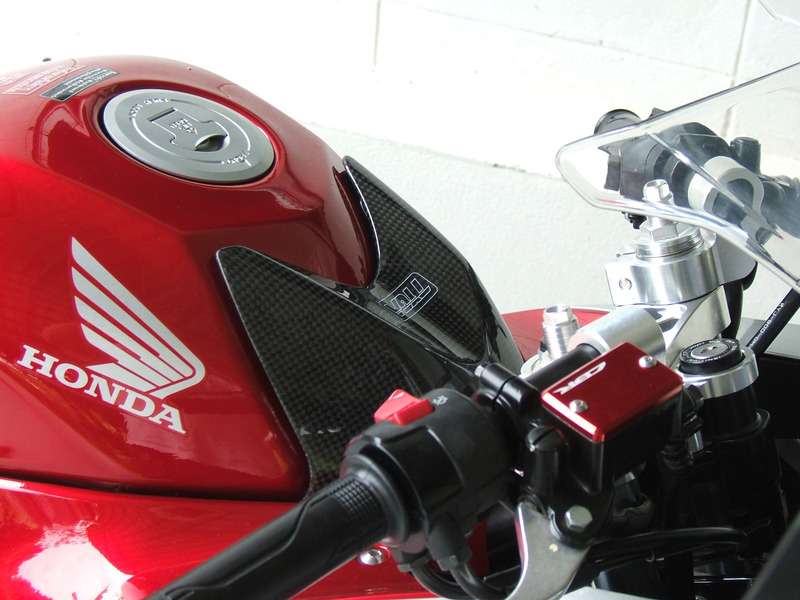 We have also added a couple of genuine Honda accessories such as the tank protector and the front master cylinder reservoir cap. 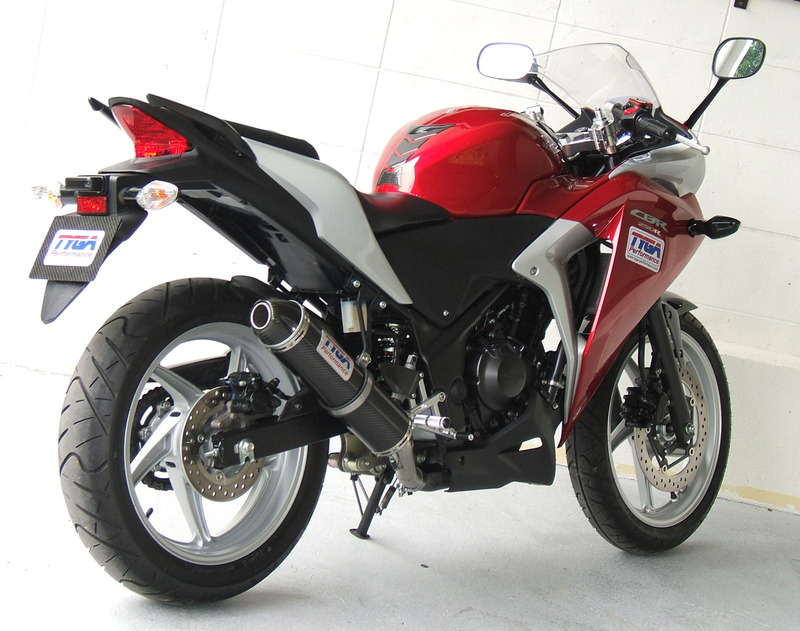 There is a whole range of Honda items such as fork end caps and bar end weights which are not featured on this particular bike but we offer in our store. 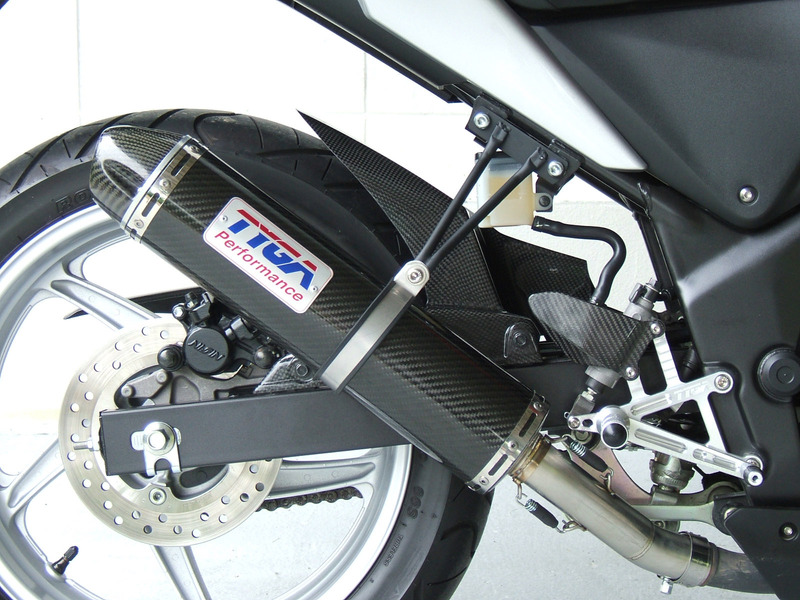 Completing the list of modifications, our bike sports a prototype carbon slip on exhaust system. This liberates 4 kgs from the stock one, never mind the enhanced looks and the better performance it offers. 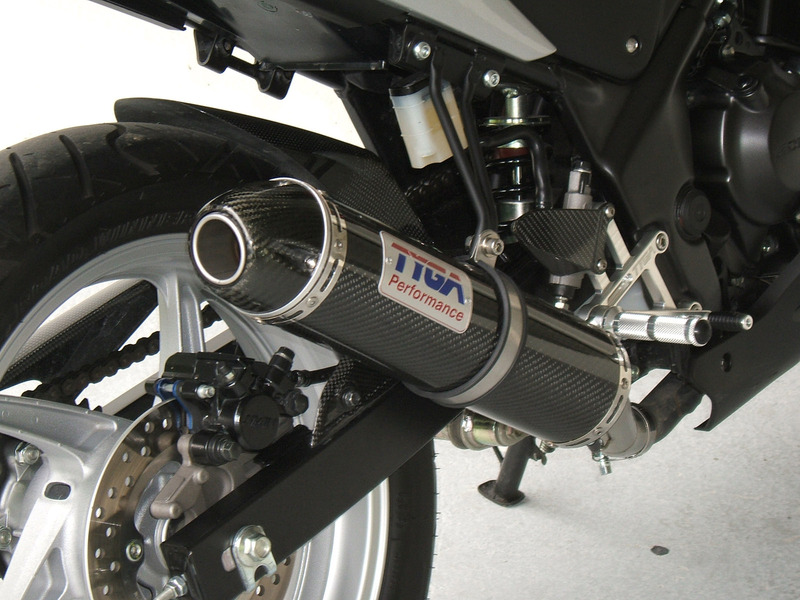 We will be offering exhaust systems for the CBR with a few variations on the theme for more individual customisation. 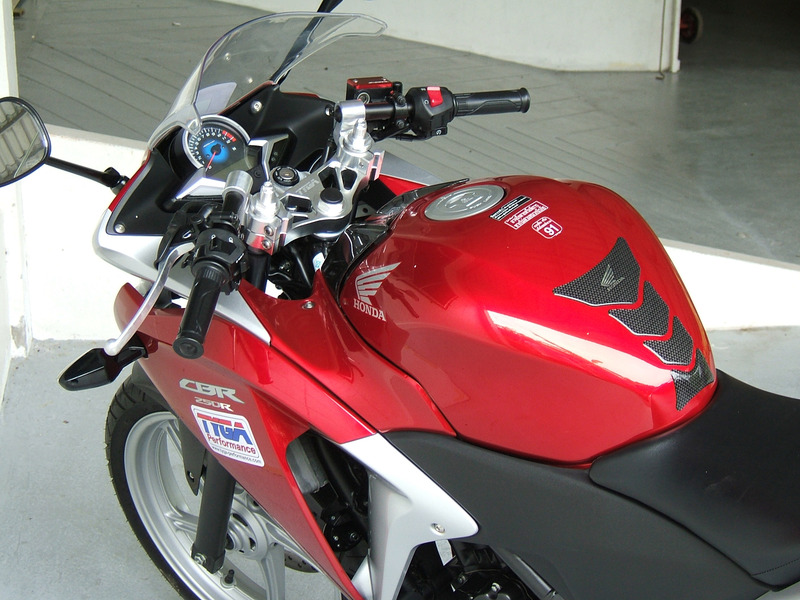 The system here shows a round silencer with a carbon end cap.